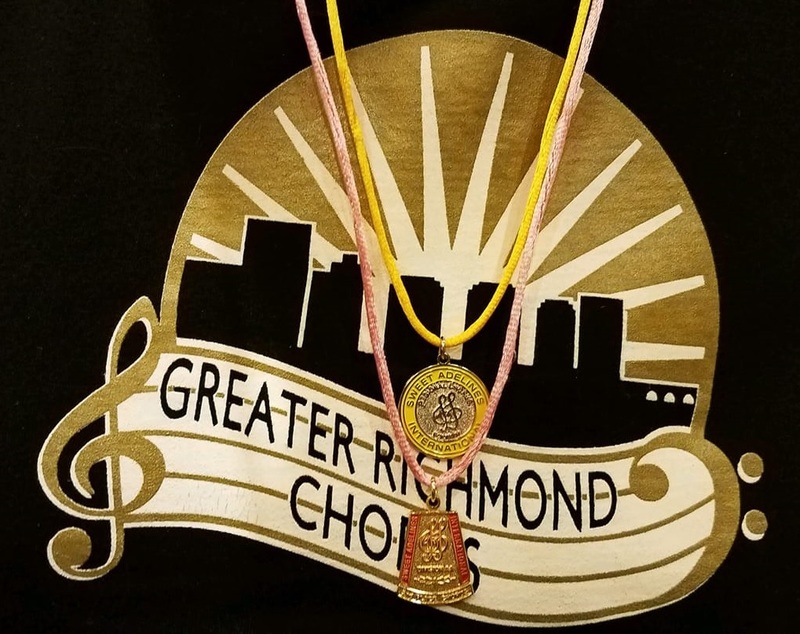 Greater Richmond Chorus - 2019-03-26 - Chorus news item: Success at Region 14 Contest! Success at Region 14 Contest! GRC was so excited to travel to Concord, NC on March 21, 2019 to participate in the annual Region 14 Contest and Convention! This is a great opportunity to spend time with our regional friends and to showcase our quartets and chorus. On Friday, all quartets took the stage to show off their performance packages. This year, we had 6 quartets representing GRC! It was great to cheer for each of them as they put their best feet forward! We were so proud of each of them! REV'L earned second place in the quartet contest, bringing home a set of beautiful red ribbons. On Saturday, the chorus contest was underway with GRC performing 12th. We took the stage after preparing for many, many months of singing, choreography practice, and with the help of a number of coaches including Renee Porzel and Sean Devine. The talents and dedication of our Director's Resource Team, especially the section trainers, was critical to our success! We earned an amazing score of 598, taking second in Division AA and fourth place overall. In addition to our performance, our Team Coordinator, Susan Inge, was awarded the Region 14 Leadership Excellence Award for her service to the regional over the years. We are so proud of her and the entire region rose to their feet in applause. The chorus celebrated with an evening of fun and fellowship at our chorus dinner, where we heard from our quartets. We then joined our regional sisters in the Harmony Lounge where we heard from other quartets and choruses and sang a few regional songs. It was an amazing weekend and we look forward to reviewing our score sheets and watching our video in the next few days. But, we're not ones to rest! We'll soon begin preparing for our autumn show in November. Stay tuned for more info to come soon!